Four more suspicious packages containing possible explosive devices were discovered Thursday night and Friday. They were addressed to Send. Cory Booker and Kamala Harris, former Director of National Intelligence James Clapper, and liberal billionaire Tom Steyer. Cesay Sayoc Jr., 56, was arrested late Friday morning in connection to the mail bombs. Four more suspicious packages came under investigation Friday, the latest in a slew of explosive devices sent in the mail to high-ranking Democrats and critics of President Donald Trump. The newest packages were addressed to Democratic Sens. Cory Booker and Kamala Harris, as well as liberal billionaire Tom Steyer and former Director of National Intelligence James Clapper. The explosive device intended for Booker was intercepted at a mail facility in Opa-locka, Florida, Thursday night, while the one addressed to Clapper (care of CNN, where he now works) was found at a post office in Manhattan Friday morning. The Opa-locka mail facility is believed to be where several of the other suspicious packages sent out this week were sorted through. Broward CountyFriday morning, Florida officials arrested Cesar Sayoc in connection to the mail bombs. 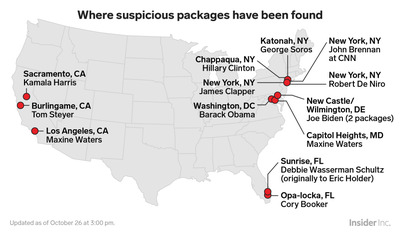 The packages intended for Harris and Steyer were discovered later in the day, in Sacramento and Burlingame, California, respectively, according to the Sacramento Bee. As news of the latest packages was breaking late Friday morning, authorities arrested a suspect in connection with the now 14 mail bombs. 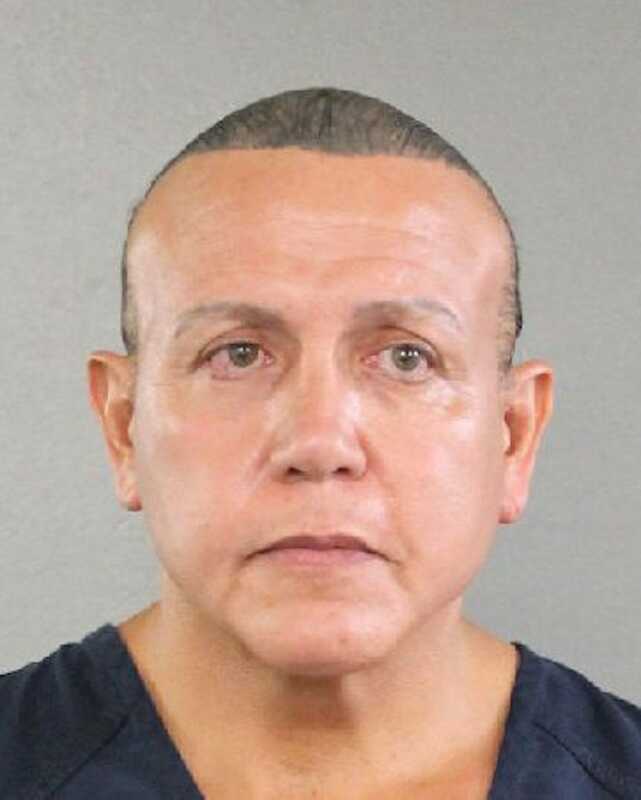 Cesar Sayoc Jr., 56, was arrested in Plantation, Florida and will be hit with five federal charges in connection to the case. Like the 10 previous recipients of mail bombs this week, Booker, Harris, Steyer, and Clapper have been outspoken critics of President Donald Trump. ince retiring at the end of President Obama’s administration, Clapper has spoken out against Trump’s leadership on national security issues as an analyst for CNN. “I think anyone who has in any way been a critic, publicly been a critic of President Trump, needs to be on an extra alert and take some precautions, particularly with respect to mail,” Clapper said. “Cowardly acts of terror will never silence or intimidate Americans-they will only strengthen our resolve to stand against fear & hatred,” Booker added. Biden and Waters received two packages each. Experts have said that it appears the explosive devices were only meant to scare, since none of them have gone off. If you have information on the case, the FBI is asking you to call 1-800-CALL-FBI or go to tips.fbi.gov.